Jake Raye is back, and in kickboxing-related trouble once again! Since the last Bloodfist film, Jake became a legit kickboxer, in state-sanctioned bouts with boxing gloves, etc., and put his punchfighting past behind him. When he accidentally kills his opponent in the ring, he vows never to fight again. After about two years have passed, Jake has hit the skids. His apartment is in disarray and he’s not in shape. One day, he gets a call from his friend, a Black man inexplicably named Vinny Petrello (Smith), who lures him back to Manila once again. Once back on his old stomping grounds, Jake and a bunch of other fighters are kidnapped and spirited away by boat to the private island home of sinister kickboxing fan Su (Avellana). He forces the men to take part in an “illegal high stakes tournament” - death fights, or as Su calls them, “gladiator fights”. But Su’s men have an unfair advantage. He pumps them full of a special steroid that makes them impervious to pain. So the good fighters don’t know what they’re up against. Luckily, the plucky Jake Raye and love interest Mariella (Reyes) get to the bottom of it. Will Jake live to see another sequel? 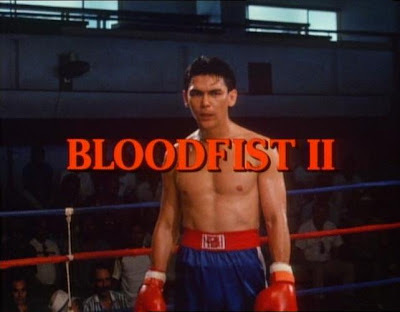 For those that don’t know, only the first two Bloodfist films are truly sequels. The Dragon plays Jake Raye in the first two films only. The other 897 Bloodfist movies are basically separate entities but renamed under the Bloodfist banner because presumably Roger Corman felt fans would rather see an eighth sequel to something, whether it’s truly a sequel or not, than a new movie with an original title. Interesting logic. Nevertheless, the first half of Bloodfist 2 is very similar to the original film - the same locales are used and some of the situations seem oddly familiar. But once the fighters are on the boat to Su’s house, things change. The movie somehow becomes dumber, yet more fast paced, even though a huge block of time is spent in one room as the fighters fight. Yet it never becomes a slog. That was pretty impressive. It was here that the film developed its own, more original personality. And of course, the film ends with a big, final brawl. Avellana is back as the bad guy, but not the same one from the first movie. And the rankings of the fighters/actors are back in the credits, but the movie outdoes itself in introducing these men to the audience, as Su names them all, and their titles/rankings in the movie as well. In the order Su introduces them, they are: John Jones (Warring), Manny Rivera (Samson), Bobby Rose (Hill), Ernest Santana (Rogers), Tobo Castanerra (Del Rosario), and Sal Taylor (Baker), the last of which sports a spiffy shirt throughout the entirety of his screen time. Additionally, Ned Hourani and Cris Aguilar return from the first movie, but in different roles. Don The Dragon gives his delightfully wooden delivery we all know and love. Bloodfist 2 is more of a typical punchfighter, but the action and humor elements are ramped up more, and the plot is tamped down to a minimum. Since all Bloodfist movies apparently had to be 85 minutes, the filmmakers decided to try a new structure, at least for the second half of the film. 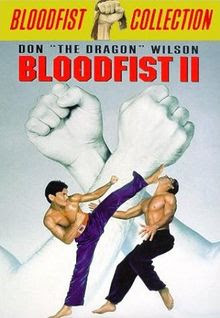 If you watched the first Bloodfist movie and wished it had MORE punchfighting, as well as more silliness, this, the only true sequel, is the movie for you. NOTE: in the end credits, Wes Craven and Stephen Tobolowsky are listed as “advisors”. If anyone knows how Craven or Tobolowsky advised this movie, please write in today. Oh man, is this Bloodfist May? BRING IT ON! That is a killer idea, but there are too many "Bloodfist" movies to fit in one month! I've been meaning to do this one myself for a while now, but I need to buy a copy first to get images and re-watch it to refresh my memory. This was pretty much an Enter the Dragon remake, which wasn't bad. It's the only Bloodfist I don't have reviewed at the DTVC, it's my White Whale! DTVC: Looking forward to your take on it! Hope you can watch it soon! Nebular: We're happy to bring back memories for you. Also you're right: Don is one of the greats! I just bit the bullet and ordered it used from Amazon. Hopefully I'll be able to make it happen sometime next week. Very Cool! Looking forward to your opinion on it DTVC! It is classic Don "The Dragon". Lot of great fights in this! Love your line about NOT turning it off this time. Haha.